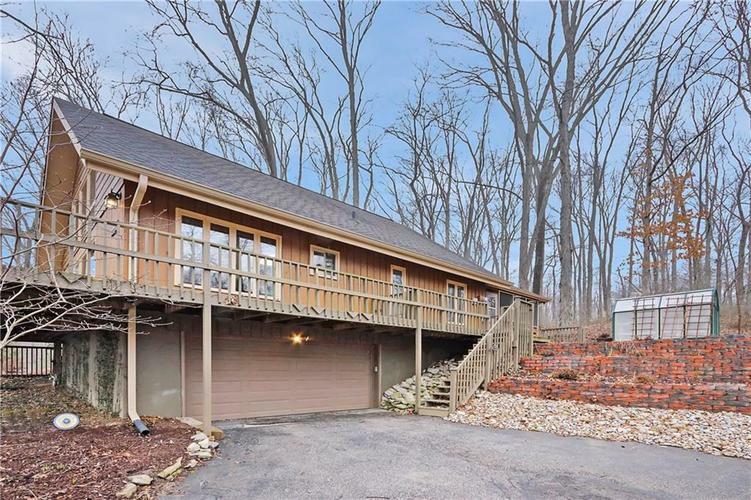 Are you looking for a home with a lake view, wooded lot & wildlife? Lake DeTurk is a 35 acre water playground, & 4 parks to provide recreational & clean space for all residents. This is a 4 bed, 3 full bath home with over 2400 sq/ft of living space. Main level contains vaulted ceiling in the great room with masonry gas log fireplace & large windows that provide the lake view. Main area opens up to dining room & kitchen with a breakfast bar. Additional 2 beds, 2 full baths & family room on the main level. Upstairs - 2 beds & 1 full bath. Finished basement with storage & access to the garage. Partially fenced yard, fire pit, 2 mini barns & beautiful landscape. Wrap around deck with screen-in porch allows you to enjoy this private sanctuary! Directions:From Indy, follow SR37 S to Martinsville, TR on Morgan St, TR on Hillview Dr, TL on Byram Blvd, continue straight, road turns into Bailliere Dr, follow to 230 on left across from north side of lake.